Borussia Dortmund could be without Marco Reus with their Champions League clash against Tottenham on Wednesday night – and that would be a massive boost for the North London club. 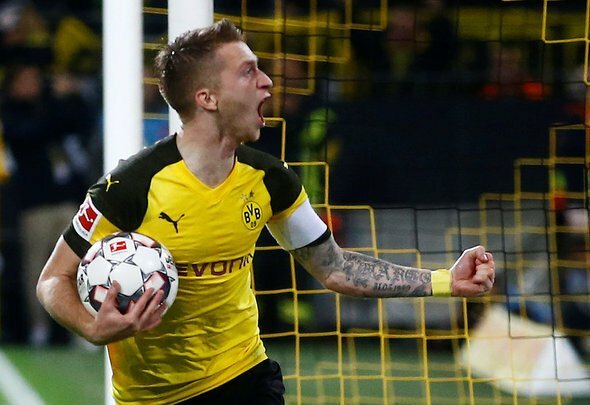 Reus, 29, has been in sensational form for the Bundesliga leaders this season, scoring 17 goals and supplying 11 assists in 27 appearances across all competitions. However it seems unlikely that Reus will be able to add to those stats at Wembley in the round of 16 clash against Spurs, with Dortmund sporting director Michael Zorc suggesting it would take a miracle for him to be ready for the fixture. Jadon Sancho has understandably made most of the headlines in England for his superb form at Dortmund, but Reus has been the driving force behind the Germany club’s success and to be without him is a major blow for Lucien Favre and his men. Dortmund were without Reus on Saturday when they blew a three-goal lead to draw 3-3 with Hoffenheim and the side also crashed out of the German Cup against Werder Bremen earlier this month after he was forced off field due to his injury. It is pretty clear that Dortmund struggle to operate without Reus more than Tottenham do without Harry Kane. Kane and Dele Alli will miss the first leg against Favre’s side, but there has not been as much of an impact on latest results in North London. The entire Tottenham fanbase will surely be licking their lips over the fact that Reus is unlikely to play in this game, especially as Dortmund are being made out to be the slight favourites right now. If he misses the second leg as well, then Spurs have a major chance of reaching the Champions League quarter finals.